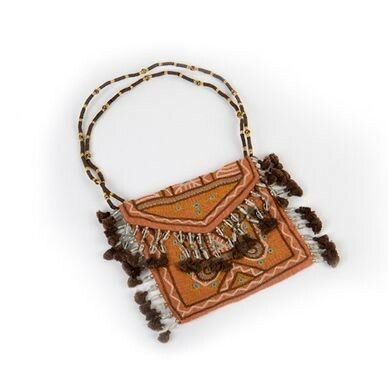 This hand-embroidered purse from India's Kala Raksha Vidhyalaya gives you a wearable work of art with centuries-old history and contemporary embellishments that honor India's past and present. This piece of this wearable art is based on the traditional gupchi, an envelope shaped bag, which is part of a woman's dowry. The contemporary embellishments coupled with historical perspective make this purse work equally well with casual or evening wear, and invariably earn you questions and compliments in either setting.